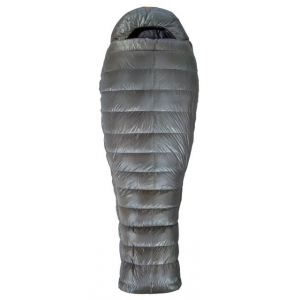 While a bit bulky to carry, there is no greater reassurance after a hard cold day on the trail than knowing you will be warm at night. Used it on a 2-week tobboggan trip with -30°F temp; an obviously appropriate use of such a bag. I also used it on a traverse of Labrador by canoe and foot. Even though it was September/October with lows only in the teens F, the bag was basically an insurance policy on a very challenging trip. I wouldn't bring 3 extra pounds of cook pots, but on a tough trip, I will gladly carry 3 extra pounds of goose down. 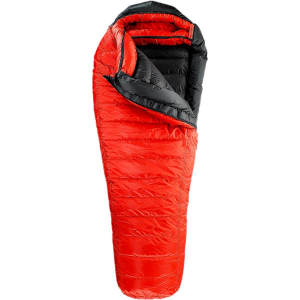 At 5 lbs and the size of a couple of volleyballs this is obviously not an ultralight backpacking sleeping bag. However, for really cold or tough trips, having this bag along gives me a great deal of physical and mental comfort. Its performance in deep cold is near to advertised. The coldest I've used it at was a bit worse than -30°F in northern Ontario. I did need a toque, longjohns and socks to be really comfortable, but ... I was comfortable and considering that when I lay on my back, my breath fell back down as snow, I had no complaints. That was a 2-week February toboggan trip and the bag was "no-brainer" to bring. Less obvious was a September-October traverse of northern Labrador obsensibly by canoe. 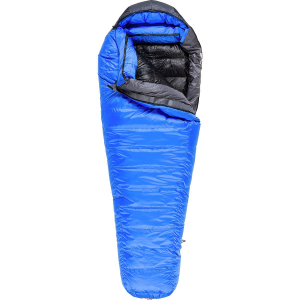 We started in late summer, so the idea of bringing a -50°F sleeping bag was at first absurd. And I didn't bring it — at first. However, as our small crew headed east toward the George River, we encountered some light snow and a few nights where my old 3-season bag needed all the help I could layer on; OK, but marginally so. Past the George River we would ascend to the Labrador Barrenlands and I was regretting not bringing the heavier bag. A fourth team member was planning to join us by bush plane after the George River, so I got on the sat-phone and asked him to stop at my girlfriend's house on the way and pick up my Blue Ice. That was a fortunate idea. After crossing the height of land above the George River into Labrador two things happened: the river we were to follow disappeared into the rocks and it started snowing. The next river to our north was about 20 miles in a straight line. It was one of the most arduous journeys of my life. We pond hopped as we could, but had to carry the entire kit for at least 15 miles. The wind rarely blew less than 30 mph and while we had a couple balmy days in the 50's, it was generally near freezing and downright cold at night. The intense physical effort and cold temperatures were a strain and sheltered campsites were sometimes just not to be had on the tundra. However, I loaned my buddy my 3-season bag to add to his and with me in my Ice Blue, a warm comfortable sleep at night always had us recharged for the rigors of the new day (my other two crewmates had flown back home from the George). Yes, it is some extra weight and space in the pack, but the peace of mind and sound restful sleep on a tough trip is priceless. This bag is unbeliveably warm yet big enough to store all the things you want to remain warm at night like clothing and liquids. The only flaws are the zipper which could be better but I guess this is easily fixable so not worth tripping over and the size which is almost too big but yet again, it gives you more storing place and it did not compromise my comfort one bit. It was about -23 outside and I slept like a rock. 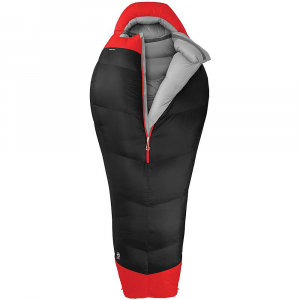 And that's not even mentioning the price which helped me sleep like a rock even when not using it :) I would recommend this bag to everybody who's on a relatively tight budget and wants to have a great bang for their buck. Enjoy! The Backside Blue Ice -50 is not available from the stores we monitor. It was last seen sometime before 2006 at Open Trees.